Last month I teamed up with Vanesa Hansen in Manhattan Beach, CA to shoot some fitness samples and share her story. At 26 years old she was diagnosed with breast cancer. I wanted to take some time to for her to share part of her story and some images we created. I was a free spirit. Absolutely invincible. At age 26, I lived each day carelessly. Days passed, time passed, and I spent my time behind a desk and in the gym. Unhappy with myself and not knowing how to appreciate true beauty I set out to get a consult for breast augmentation. The prior 2 1/2 years, I spent countless hours in the gym strength training. The gym was my sanctuary. I loved how it made me feel and look but had a different view of my chest once it started to dissipate. I scheduled a plastic surgery breast consult to discuss the topic in detail. We reviewed and discussed everything you would want to know about breast augmentation. I was very intrigued by the idea and decided to go forth with the next step. Now to get a mammogram at age 26. I decided to contact my obgyn who was kind enough to listen to my request and we submitted the request for a mammogram. Denial after denial, we submitted the same request for a mammogram about 4 times until finally we received an approval. An abnormal mammogram (March 2016) turned into a biopsy (April 2016) which unveiled abnormal calcifications. I had the option of a bilateral or unilateral mascetomy. Now chances of the cancer spreading to the right side were strong. 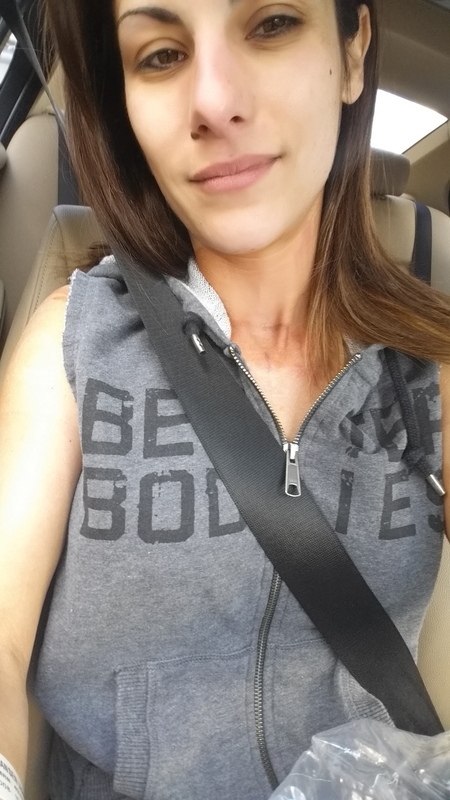 August 27 2015 I had a full bilateral mastectomy w/ sentinel node biopsy and breast reconstruction with expanders. Next, was the expansion process. My expansion process was roughly 2 months long, and 4 total visits with my plastic surgeon. where they used a big needle to inject the expanders (basically like a bag)which were placed immediately after the bilateral masectomy. This is an outpatient appointment. Simply have a seat, change into a open lace smock, and they inject the huge saline-filled needle into the magnetized insertion point. Depending on the desired size more expansions may be necessary. You feel a sudden rush almost as if you'll faint. The expander fills from the saline injection and stretches the skin abruptly. Each expansion took roughly a week to recover from. The skin felt like it would just burst. During this time, I usually only wore sport bras and baggy shirts/vests for comfort. December 3 2015 was my last surgery where implants were finally placed. Weeks upon weeks passed and I could not lift my arms. Could not care for myself at all. No more washing my hair, driving my car, or reaching in the cabinet. Everything felt lost. Taken away. I started lifting weights again and going outdoors. Enjoy yoga, hiking, and bike rides with my son. I have a different view on life now. Slowly regaining feeling and nerve sensations. These obstacles opened my eyes. I finally started to gain self love and respect. Now I am 29 years old and cancer free! Hooorayyyyyy!!!!! Cheers to a healthy, happy, and balanced life! I would encourage all young women to do routine checks. If you feel something or sense something is not right go to the doctor. I didn't feel a thing. No lumps or bumps. I had the desire for proportion. My family and friends opposed the augmentation consultation but I still went forth! Looking back now, it saved my life. Follow your intuition. You know what is right for you! You will be challenged mentally, physically, and emotionally. Take photos and document your journey. Don't be ashamed or hide. Reach out and seek support and assistance when needed. Find a network of strong women to empower you through your journey. We are all here for you. I've known David for over 20 years now. Both of us grew up in Livonia, MI and attended Korean Culture Camp along with other Korean Adoptees in the Metro Detroit area. At this week long daycamp, Korean adoptees would learn about Korean culture whether it was making food, reading folktales, tae kwon do, and singing songs. In the photo seen below, I'd estimate this would be sometime around 2nd grade based on our haircuts. Since then we've always been friends and attended Grand Valley State University together. What was your experience like growing up as a Korean adoptee? The experience I had growing up as a Korean Adoptee in Livonia, MI was a small rollercoaster of growing pains and difficulties somewhat similar to what we all experience in early adolescence. But overall, I feel that it was a positive nurturing one. As I look back now and reflect on my upbringing, the constant positive reinforcement from my family and friends molded me into the person I am today. Now, it's hard to say that it was all "rainbows and lollipops" as some may think from my initial statement. Yes, the city was predominately Caucasian at a staggering 99%, and yes, my Caucasian family was later fortunate enough to give birth to my 3 younger siblings, setting up an environment of easy persecution and many odd-man out scenarios. I was constantly reminded of how different I was. Whether it be a friendly/joking comment about my race, or a nostalgic review of my family photos and noticing how different I look, it was always present that I did not completely fit in. The feeling of self-identity and the longing for that "completely fit in" feeling grew ever more present as I grew and matured. I remember times in High School of my fellow peers commenting on my eyes with a mimicking gesture, a predetermination that I would excel in mathematics and many other Asian stereotypes they could throw my way. Although it was all in good fun, it was part of the reinforcing reminder that I was different. Time passed, the immaturities of High School were coming to an end, so I decided to experience something new and further my education at Grand Valley State University. I grew anxious to start over! A new school, new friends and a new me. GVSU provided the medium of the diversity I craved with a vastly more diverse group of peers to engage. Not just in race, but in upbringings and perspectives as well. Unfortunately, the reminders of how different we were still existed. I can recall a few scrums breaking out due to an unwelcome racial comment that I otherwise feel would not have happened had I been a different race. Similar gestures and stereotypical comments lingered throughout my 4-year enrollment, but far fewer than my early years. I was lucky enough to amass a large group of friends who understood my predicament and sympathized with my feelings. As my identify quest continued, I sought out an opportunity to move to Boston, MA. A far larger melting-pot of cultures than what Michigan could provide. It was here I started to find my identity. A heavily transplanted population including many diverse groups of race, religion, background, sexual orientation, beliefs, origins, socioeconomic status, language, age and much more! It was here that I started to feel less like a standout, and more like the norm. I share this small glimpse into my life in hopes to encourage a better understanding of our particular group. You may be lucky enough to read many stories or interact with many adoptees, not only from Korea, and you will find that no two are alike. And that is the exciting part that I have come to terms with. I(we) don't have to have to be one specific thing or belong to one group. It has taken some time, but I am overwhelmed and humbled by the upbringing I have had, and the future experience I hope to have. If you struggle with this sense of belonging I expressed in my passage, I highly recommend you to seek those who are like you and interact with them as much or little as you feel comfortable. As you can tell, many of my life decisions were heavily weighed by a continuing quest to find a sense of belonging. Today, the great support I have had and the individuals who have been apart of it are the real reason I was able to cope and navigate a life as a Korean Adoptee. What are a few things you wish more people understood about Korean Adoptees? The one thing I wish the general population would know or understand about Korean Adoptees is that we are a group of people that almost always find ourselves striving to identify who we are. It is something that I battle from time to time, and a message I hear from almost all Korean Adoptees. We are a group that is not quite Korean nor do we feel like we are 100% American. What's one Korean dish everyone should try? I don't think there is just one dish that everyone should try. I might be biased to some extent, but as an individual raised on an American diet I find the diversity of Korean food paints a broader picture of our culture. Today, I live in the little Korean-Town area of Boston and I eat it almost every day. Exploring the many dishes has been nothing but a welcoming culture shock. I do understand that there are many cuisines out there that would all say similar things, so if I had to narrow it down I would say try Sagol Budae Jjigae. It is a spicy stew with tofu, ham, sausage rice cake, vegetables and ramen noodles! FYI this is not a one-person entree meal, so bring some friends. Korean food is meant to be ate in the family style anyways! You recently mentioned to me you're apart of a Korean Adoptee Group in Boston. Could you expand on that and give us some information about what the group does, and what made you decide to join a group that's important to you?